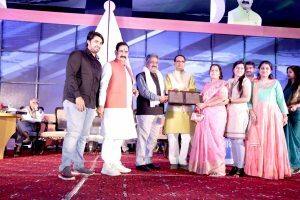 Bhopal, April 11, 2018 (Muslim Saleem): Chief Minister Mr. Shivraj Singh Chouhan has announced to raise the cashless treatment limit of journalists under Health and Accident Group Insurance Scheme to Rs 4 lakhs. Till now the limit was Rs 2 lakhs. He also announced to increase financial aid given in case of a journalist’s death from Rs one lakh to Rs 4 lakh, aid given for camera damage to journalists from Rs 25 thousand to Rs 50 thousand and 5 percent interest grant on housing loan up to Rs 25 lakhs. Mr. Chouhan was addressing the national, state-level and regional journalists’ felicitation ceremony at the CM House today. CM Mr. Chouhan said that journalism is an extraordinary and challenging task. A journalist has to fulfill different responsibilities under different circumstances. The desire and struggle to give a piece of information the shape of news is not easy. The journalist plays a significant role in democracy. He is the pillar of the system and bringing shortcomings to light is the most important responsibility of a journalist. The struggle in taking out news from news is mostly not visible. Quest for news during natural calamities, communal tension or terrorist activities can be fatal. He said that journalists should continue to be alert and active in bringing truth to the fore and give the society the right direction. Madhya Pradesh respects the role of journalists in social concerns and understands their sense of service towards the society. In this connection a Shraddha Nidhi has been set up for senior journalists. Making a mention of the changing phase of journalism, he said that the contribution of journalists during independence, freedom movement and emergency is importance and unforgettable. He also spoke on the effects of modern technique on the present day journalism. He mentioned about the leading journalists of the state and country. He felicitated 30 journalists with national, state-level and regional journalism award for the year 2015 and 2016. In his welcome address Public Relations and Water Resources Minister Dr. Narottam Mishra said that journalists have to be constantly active and alert. They have to face new challenges and fulfil responsibilities every day. State government respects this role of journalists. Commissioner Public Relations Mr. P. Narhari proposed the vote of thanks. MP Mr. Alok Sanjar, Mayor Mr. Alok Sharma, Chief Secretary Mr. B.P. Singh, Principal Secretary Public Relations Mr. S.K. Mishra, senior journalists, public representatives and officers were present on the occasion.